Let's celebr8 cos txts r GR8! Texts R turniN 20: on mon. it'll b d 20th anniversary of d v 1st txt msg. d 1st eva msg wz "merry xmas", & it wz snt by engineer Neil Papworth 2 Vodafone UK's Richard Jarvis. 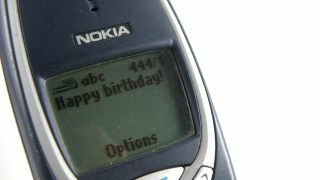 Texts turn 20 years old today. It said "Merry Christmas", and it was sent by engineer Neil Papworth to Vodafone UK's Richard Jarvis. The rest was history - albeit slow history, because it took a few years for SMS to take off. When it did, though, its growth was explosive. SMS was launched commercially in 1995, and teenagers quickly twigged that sending texts was quicker, easier and much, much cheaper than making phone calls. The fact you could send messages without actually having to talk to anybody was a bonus. The arrival of pay as you go SIMs in 1996 and network interoperability in 1998 sent SMS's popularity into orbit: today we send not millions, not billions but trillions of SMS messages every year. The popularity of SMS wasn't entirely positive - phones' tiny keyboards and SMS's character limitations encouraged the spread of txt speak, which turns every sentence into what looks like a Prince song title. And when networks cottoned onto SMS's popularity, they brought in per-message pricing that was hilariously evil. And, of course, the technology enabled such despicable behaviour as people dumping boyfriends and girlfriends by text rather than meeting them face to face. But SMS has saved millions of people a great deal of time, and probably a great deal of money too. SMS is the friend of the skiver (you don't need to pretend you've got the plague if you text the boss to say you're not coming in) and the fibber (you can say you're in the library when you're really in the pub). It's a boon to activists, many of whose protests are co-ordinated by texts, and to the disorganised, who can let you know that yet again they're running late. What I like best about SMS, though, is that its popularity was entirely accidental: it was designed to enable phone engineers to communicate with one another, not for the global transmission of OMGs and "There in 5"s.
It's a great example of what I love so much about tech: you never know which new thing is going to be the Next Big Thing, or what people will use a technology for. Now if you could excuse me, I just need to reply to a text. Turns out I'm owed £4,372 for mis-sold PPI. Result!